The first day of our little Palm Springs getaway felt like a very long but beautiful marathon. 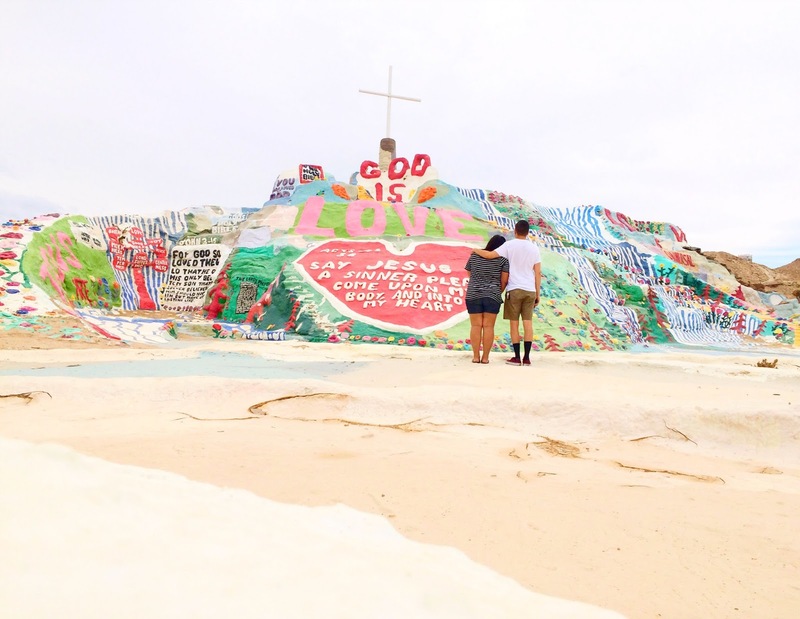 We managed to do so much in one day, including visiting Salvation Mountain. 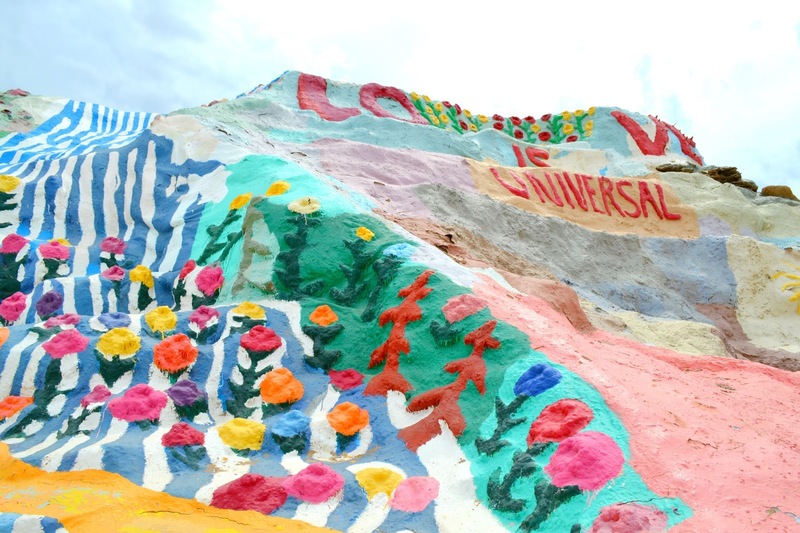 I had seen Salvation Mountain on Instagram and had always been curious and intrigued by all the beautiful colors. In my mind, it was on our way to Palm Springs. Um, yeah, turns out not so much. 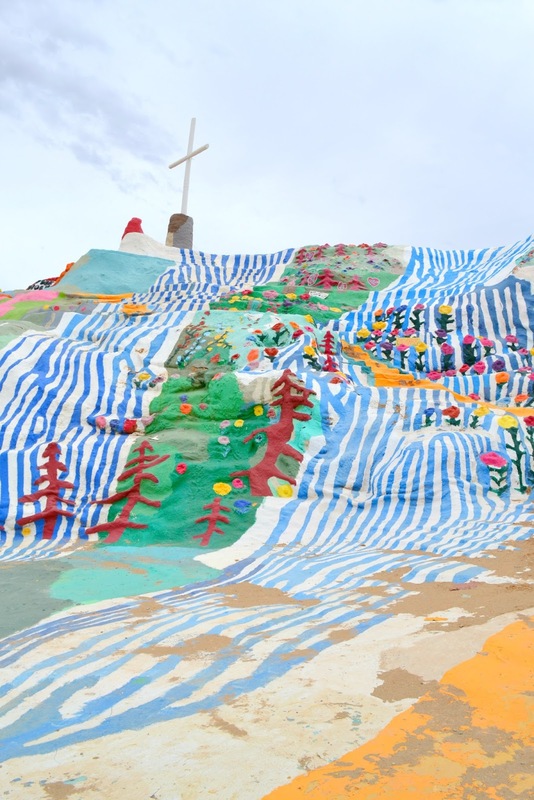 Salvation Mountain is literally in the middle of nowhere, an hour or so past Palm Springs. The drive to the mountain is almost a little spooky, but man is the sight 100% worth it! We went on a Wednesday morning, so there was no one there. That made it so much more relaxing and beautiful to just be able to take everything in so peacefully. 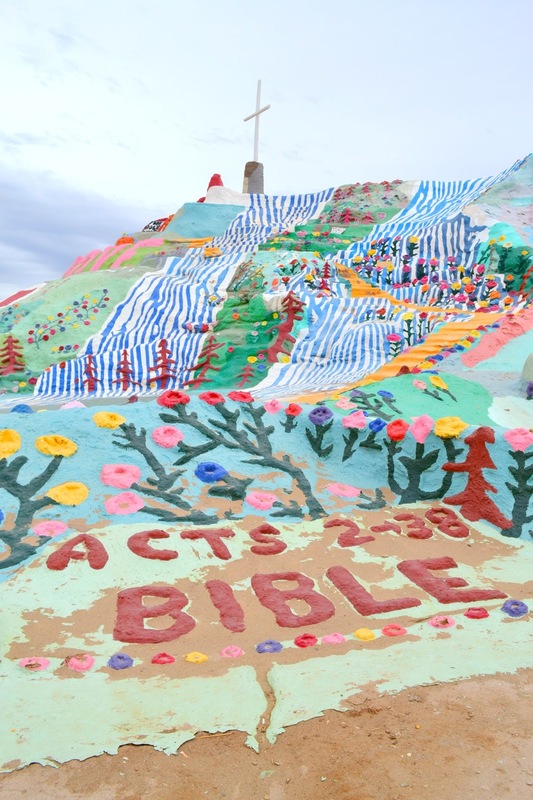 If you've never heard of Salvation Mountain, it is a piece of art in the shape of a mountain made of adobe, straw, and a ton of paint. 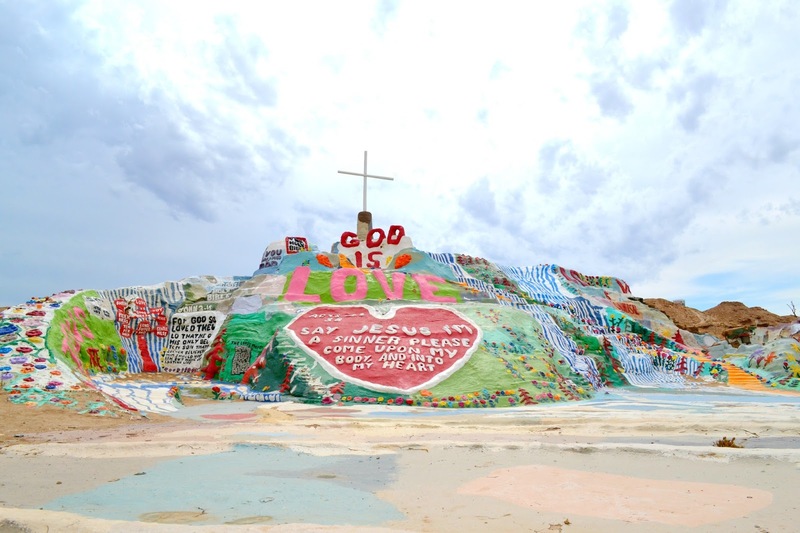 It was created by an artist named Leonard King, and the entire mountain is covered in Bible verses, prayers, and words of encouragement. No pictures can do this place justice (but I'll try! ), you just really have to see it for yourself if you ever get a chance! 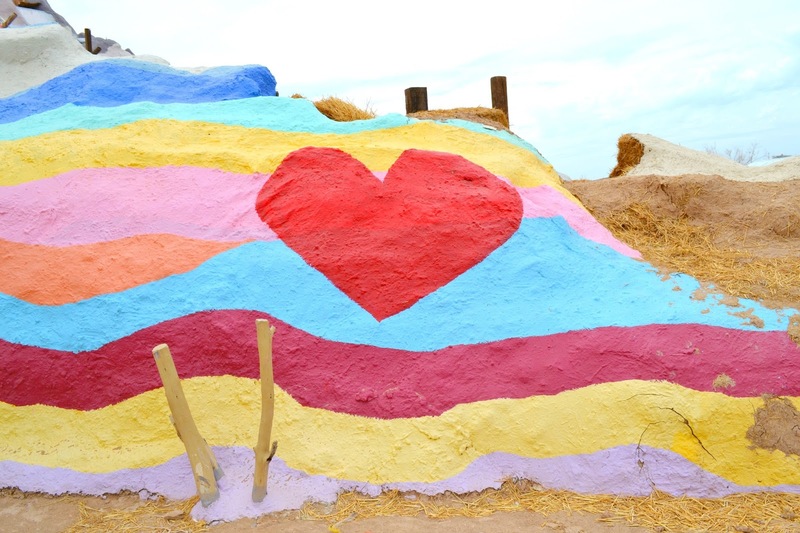 One of my favorite things about the mountain was this little dome of love! 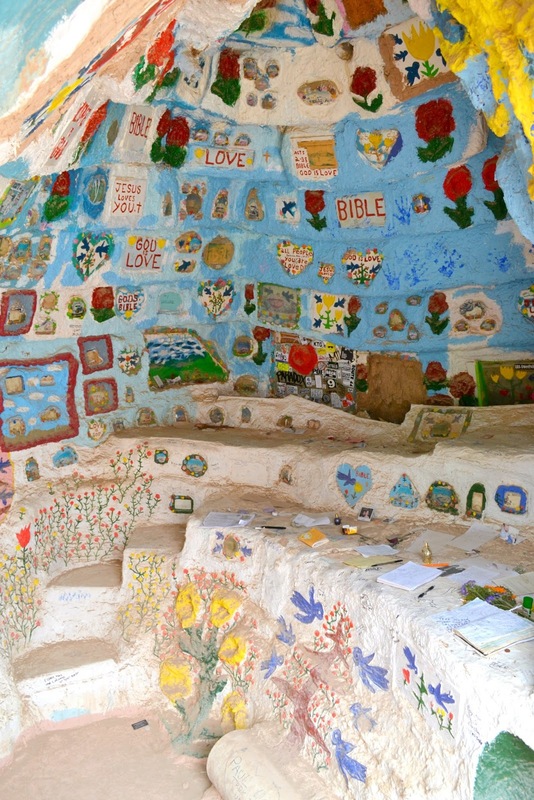 Visitors have left little photos, notes, offerings, Bibles, tiny trinkets, all full of encouraging and loving words for future visitors to enjoy. 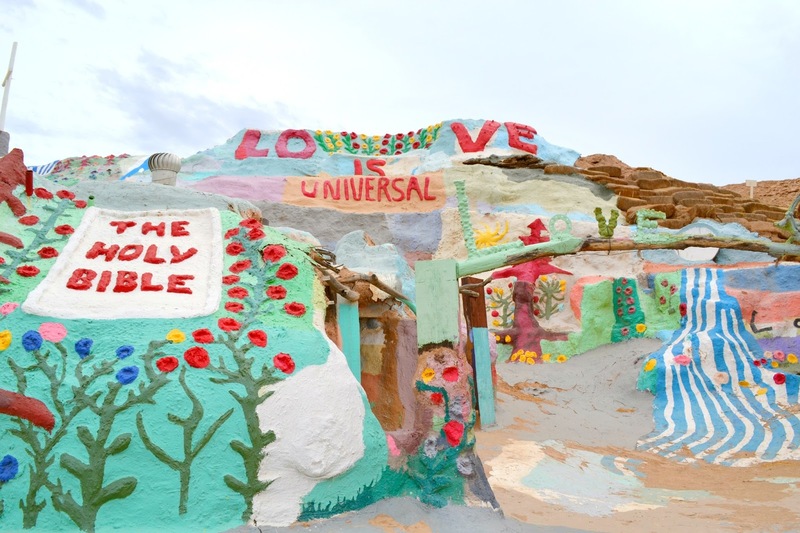 So sweet, and that truly embodies what this place is all about. 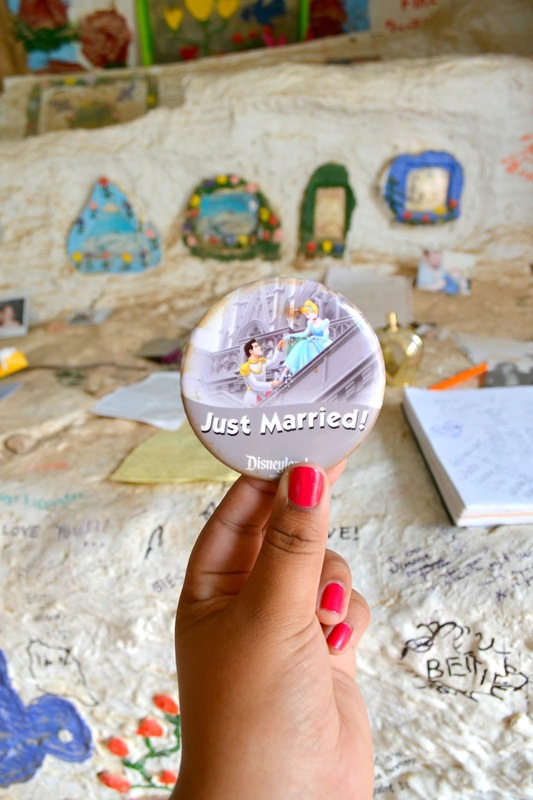 We left our favorite Bible verse in a notebook, and our "just married" Disney pin that we had randomly in our car. I'm one of the sappiest people you'll ever meet, so I was overwhelmed at how beautiful and touching all of this was. It makes me happy to see God's word moving so many in such a beautiful way! Already itching to go back and it's only been 2 weeks! :) have a happy weekend, friends!! Wow, I've never heard of this before. 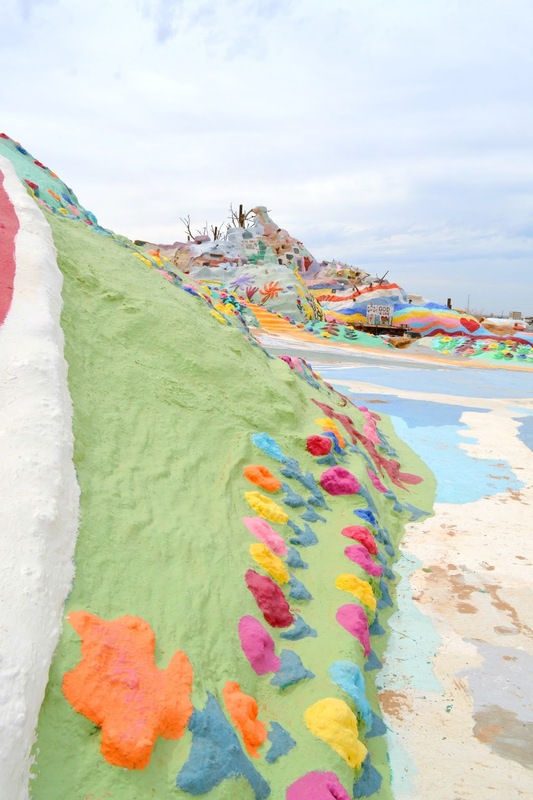 Next time we are in California, I definitely want to make a trip to see it. I love what you decided to leave. It's really beautiful, you would love it! That looks amazing. 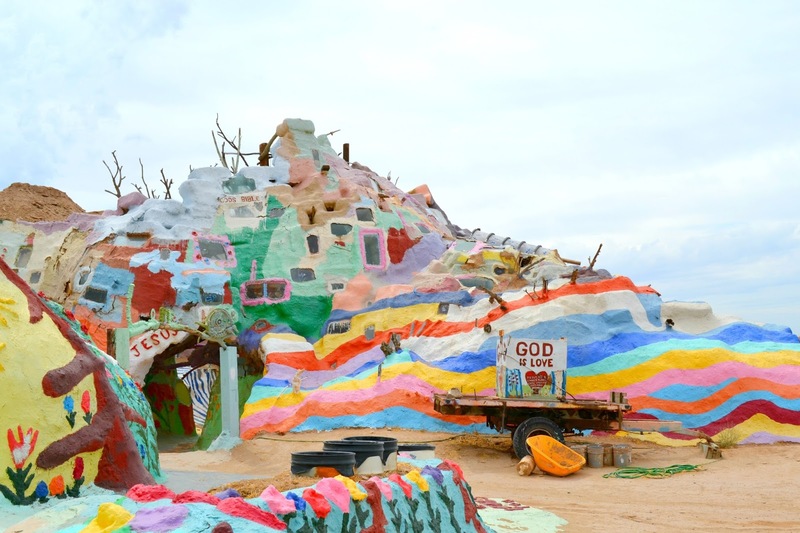 I have never heard of salvation mountain, but now I want to go. It looks like my breath would be taken away. It really would, it's unbelievable how creative this artist got! That is an awesome installation! And your photos are great! 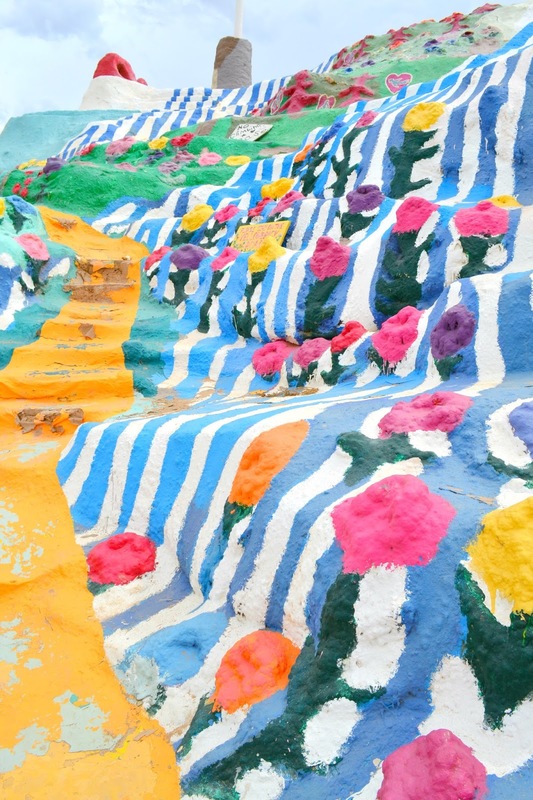 Would love to be able to go there someday. Wow! What an incredible place. The colors are so gorgeous. Great photos! How cute!!! I have NEVER heard of this place! 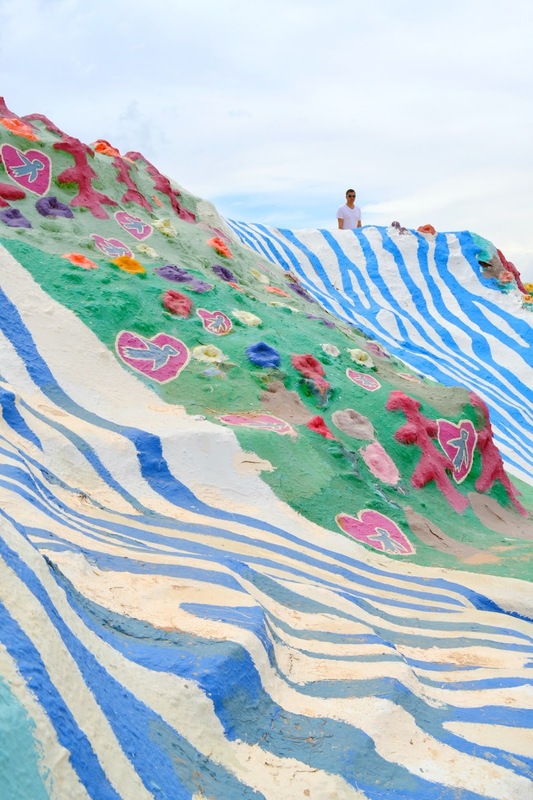 But it looks super cool, fun and the message is great! I would love to hear the history on it!!! Great post! love these photos! you're SO lucky it was overcast though! we went during the summer and that sun beating down on us.. it was so brutal. Ahh I really want to go! 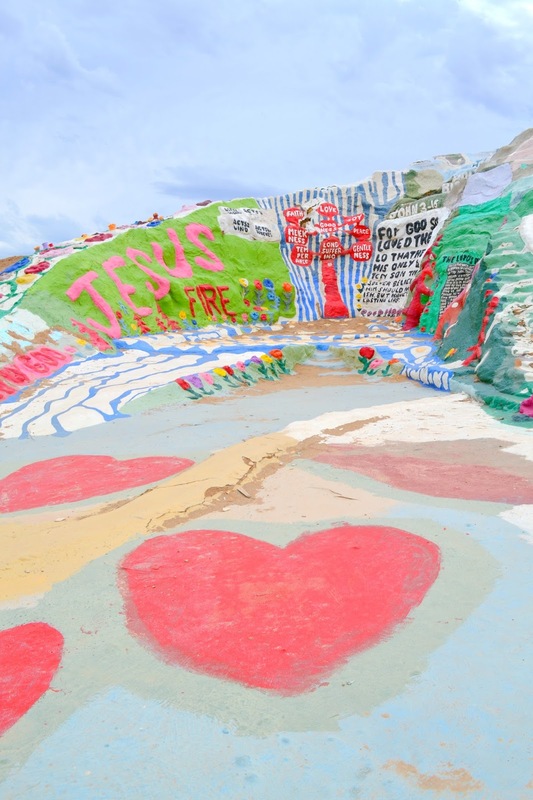 It seems like there weren't a lot of tourists while you were there; is that true?